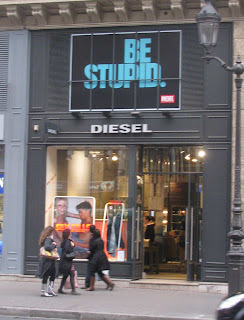 Diesel's new campaign boldly states " Be Stupid". I don't know what this speaks to you, but to me, there's no turnarounds to the very definition of the word Stupid, try as they may with their campaign. The only message that does get through is Diesel proudly boasting that its clients are STUPID! I don't know about you, but if I had a Diesel jeans, you won't see me wearing it anymore! Never have I seen communication sink so low. Whoever created this campaign, must indeed be stupid. Try as they may to make stupid sound good... Stupid will forever be..well, STUPID! "I'M SHALLOW, I LOVE SHOES"
Even more fun: you should take a look at typical American Apparel advertisements. Really I think it's no longer about "leading" people into their stores, showing them what they should wear etc. But I think it's more like getting into the skin of their targeted audience, being one of them (or how they put it "a part of their life") at least in attitude, and making them feel like X brand is their brand because that brand has the attitude. Tried and true. Although I have to agree the standard's getting lower and lower. I am sure you'd agree that the issue is not about the efficiency of the message, as much as the notorious recklessness of putting it up! Media people have no sense of morality or are flagrantly unaware of their message's effect. Maybe they are "getting into the skin of their target audience", but they are also leading society and not only following. They CONFIRM what's cool and what's not... and to me this cannot be forgiven.